When newlyweds Tyler and Hannah Bright set out to build their life together, they took the task quite literally. 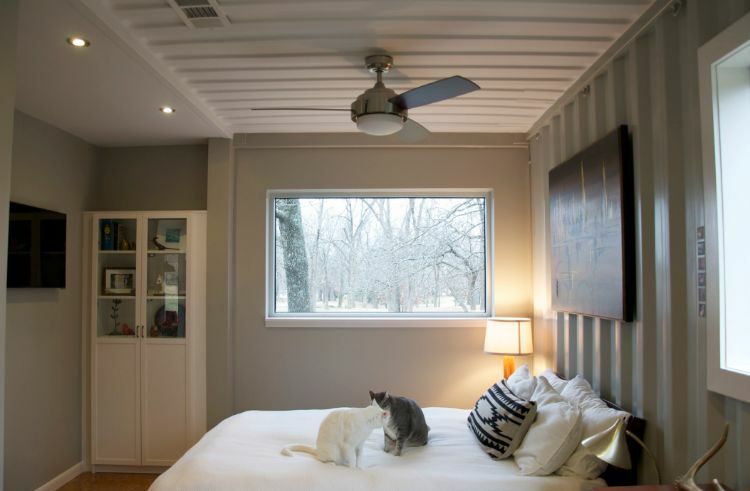 Determined to create a space that would be both good for them and the world at large, the duo decided to craft a 2,500-square-foot home out of five shipping containers. Several years and a lot of willpower later, their once work-in-progress is a stunningly modern delight that puts a new spin on thinking inside the box. 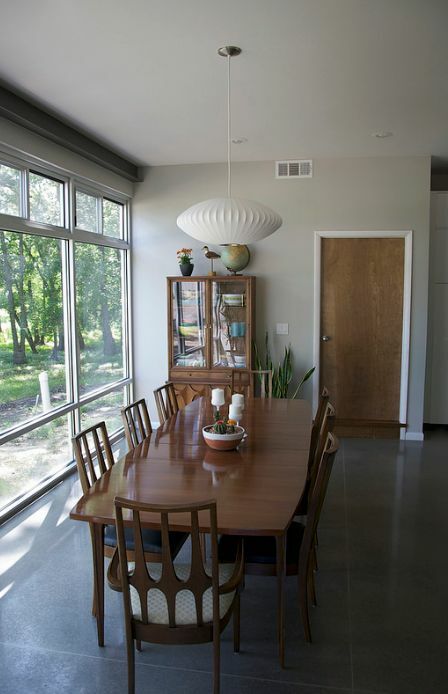 Expansive windows and a contemporary exterior lead to a bright and airy space within, decorated with mid-century modern flair. Tucked just west of Tulsa, Oklahoma, the finished abode offers a spacious layout personally tailored to the couple’s growing family of two young daughters, two cats and a dog. Unique touches, such as a vintage office door leading to the mudroom, infuse the home with character throughout, and sneaky hidden storage conceals televisions and electronics to maintain a clean profile. 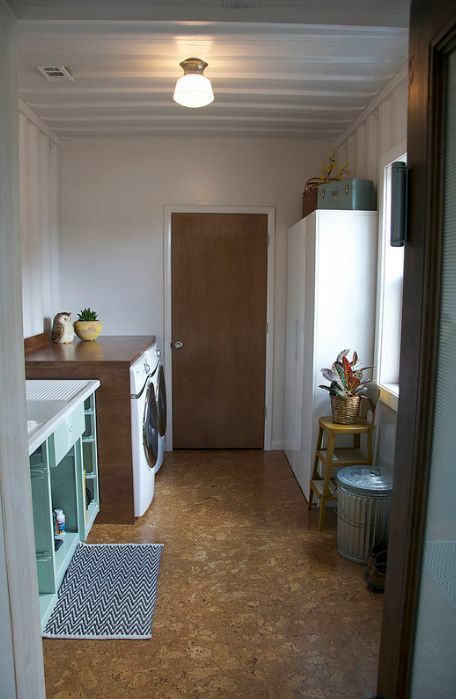 The home’s entryway leads into a small but efficient mudroom, complete with a washer/dryer with a customized wooden surround and a vintage 1940s sink cabinet restored with a mint lacquer. A sleek Ikea cabinet offers ample storage with a low-profile design. In the dining room, a table, chairs and china cabinet set found on Craigslist was restored to its original luster through lots of labor and a professional staining and sealing job. The vintage china cabinet is stocked with goodies from a similar era, such as colorful Pyrex bowls and a collection of salt-and-pepper shakers. Opposite the dining set is a coffee bar, decorated with a retro wall hanging and touches of greenery. A George Nelson bubble lamp hangs above, tying together the Mad Men-era aesthetic. The kitchen’s high-gloss white Ikea cabinets offer a sleek background for industrial-style lamps and laboratory stools, serving as seating at the bar. 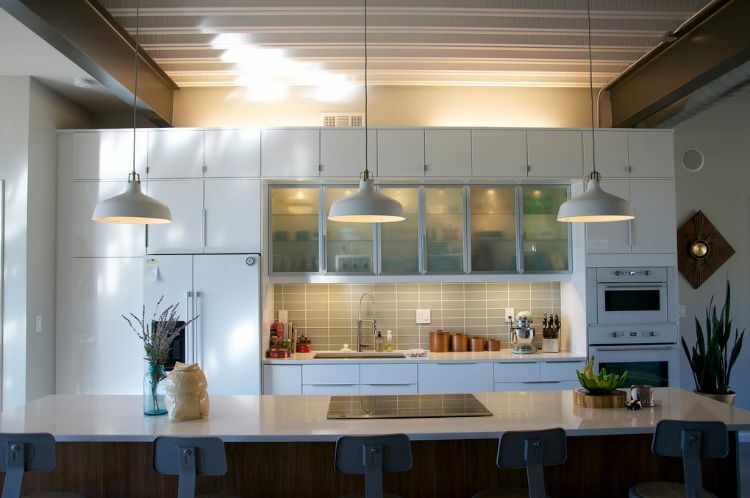 Recessed lighting illuminates dishes behind smoked-glass cabinets and above the sink, set against a pale green tile backsplash. A custom stone fireplace surround adds depth and texture to the living room, including a hidden cut-out to stow the flat-screen television. The Brights added mid-century legs to their reclaimed wood coffee table, complemented by a vintage entertainment cabinet and sleek modern artwork. 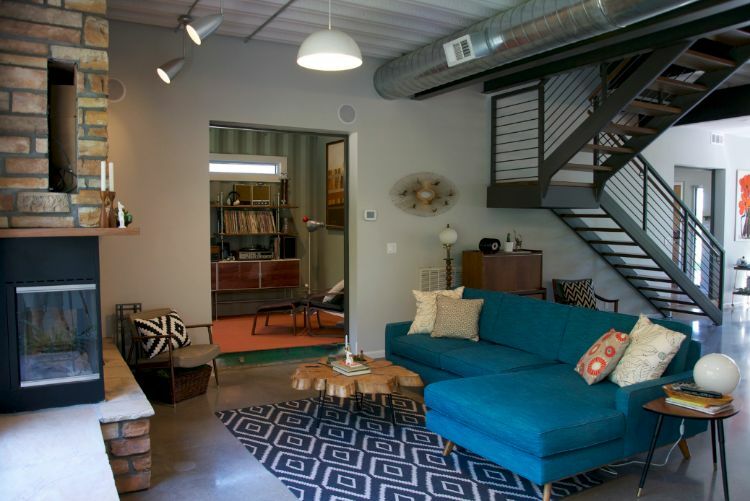 A blue sofa lends a pop of color and a comfy place to gather. 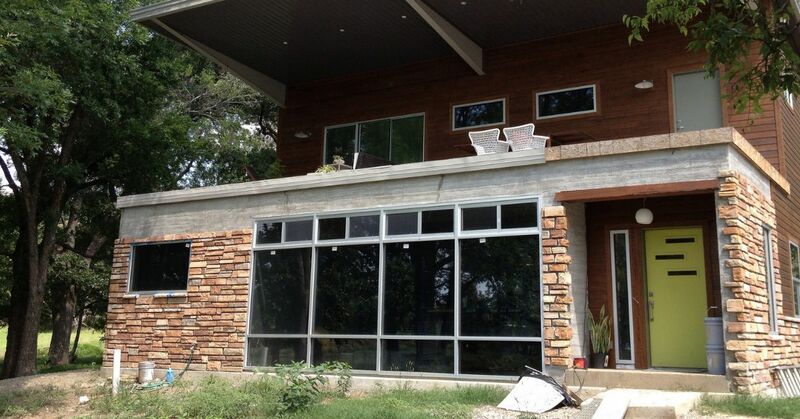 Situated on the first floor next to the dining room, the master suite takes up the length of one 40-foot container. A display cabinet in the bedroom conceals wires and TV components while showing off collectables from the couple’s 4,500-mile road trip to California. 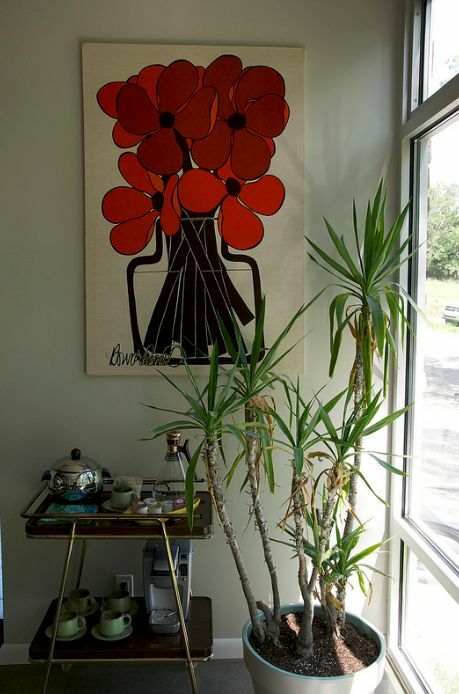 Vintage accents include a globe and planter sourced at garage sales, an antique dresser and a Herman Miller chair found in an abandoned trailer. Flora and fauna – from botanicals to kitty cats and deer – adorn the nursery. 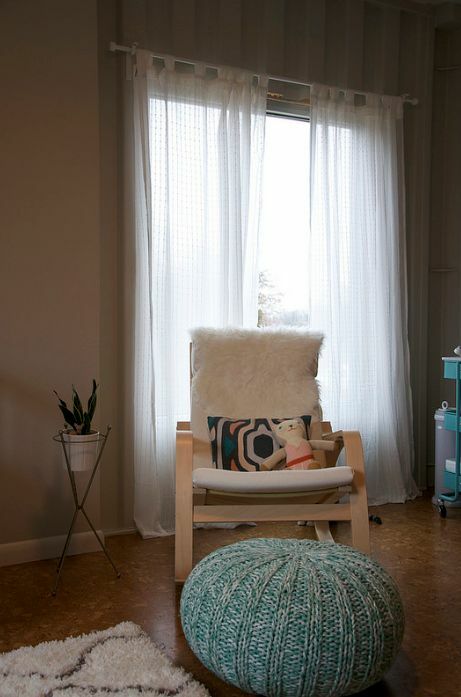 In step with the rest of the home, a mid-century chair offers a cozy place to sit and read, and a contemporary golden mobile hangs above a minimal crib.